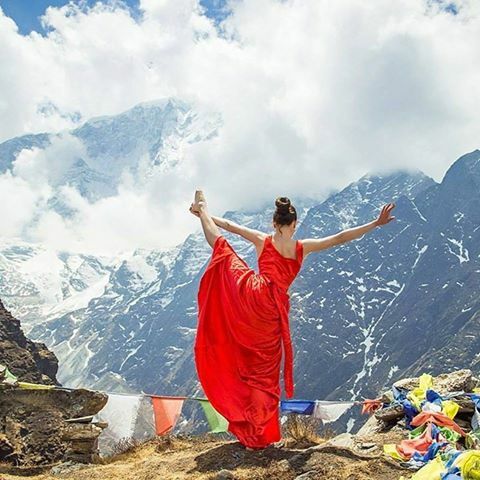 Nepal Guide Info team is excited to offer their Everest Base Camp Yoga Trek to new and experienced yogis or with mountain yoga guide. You will be taken to the most beautiful, serene, and inspiring place in the world to deepen your yoga practice. This 14-day adventure includes sightseeing, volunteering, yoga asana, philosophy, pranayama (breath work), and meditation, trekking guides and porters who will safely lead you through Nepal’s gorgeous, terrain to Mount Everest Base Camp! Namche Bazaar – mostly used for altitude acclimatization, this is also a getaway to most of the treks to base camp and other mountain expeditions in this area. The town has a number of lodgings, internet cafes, as well as supply and gift shops catering to the needs of visitors before proceeding deeper into this remote region of the Sherpa people. The Tengboche Monastery – Surrounded by immense mountains, this important Buddhist spiritual site for the Sherpa people allows you the chance to observe the life of the Buddhist monks. For decades, travelers from far and wide have been drawn to Nepal for the snow-capped mountains and legends of mountaineers climbing the roof of the world. Visitors year after year come for the mountains, and return for the people. Nepal has a significant mark of unique blend of astounding nature and beautiful people with a rich culture. Nepali people are recognized with their friendly and warm hospitality. From the ancient monuments of temples, pagodas and the sculpture and architecture of the old carvings are the excellent way to know that this country has a rich knowledge and passion of magnificent visualization toward art and architecture. Nepal’s National Parks are homes to rare wildlife and thousands of plant varieties. As the birthplace of Lord Buddha and with Himalayan peaks home to gods and goddesses, Nepal is an incredibly spiritual place for both Buddhists and Hindus. To mention it all in one paragraph is impossible, as Nepal has numerous spiritual sites and natural beauty to dazzle the eyes and open your soul. One should come and marvel in the continuous sources of inspiration and take home memories and photos that will last a lifetime. Please book your flight to arrive at Tribhuvan International Airport (KTM). Transfer from and to the airport is included. Nepal guide Info team Representative will pick you up from the airport. • A reservation requires a deposit of 15% of the total price. • The deposit is fully refundable if the booking is cancelled up to 14 days before the arrival date.